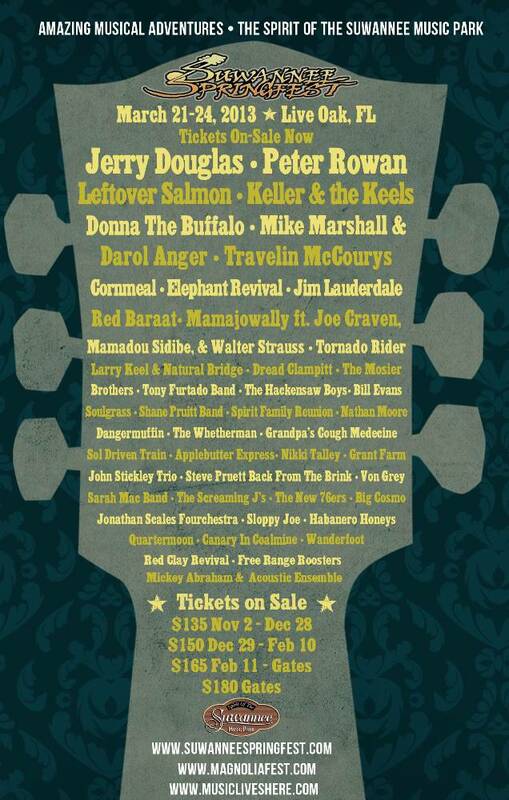 The 2013 Suwannee Springfest is has added the following bands to their lineup for this year’s festival in Live Oak, FL taking place March 21-24. Jerry Douglas, Mike Marshall and Darol Anger, Cornmeal, Mamajowally featuring Joe Craven, Mamadou Sidibe and Walter Strauss, Tornado Rider, Larry Keel & Natural Bridge, Dread Clampitt, Tony Furtado Band, The Hackensaw Boys, Bill Evans Soulgrass, Nathan Moore , Dangermuffin, Sol Driven Train, Nikki Talley, John Stickley Band, Steve Pruett Back From The Brink, Sarah Mac Band, The Screaming J’s, The New 76ers, Von Grey, Grant Farm, Jonathan Scales Fourchestra, Big Cosmo, Habanero Honeys , Quartermoon, Sloppy Joe, Canary In A Coalmine, Red Clay Revival, Free Range Roosters, Mickey Abraham & the Acoustic Ensemble and Wanderfoot. Don’t forget that ticket prices increase on December 29th, so buy yours early and save $15!